I am pleased to report on a good movie for a change. The History of Future Folk is a refreshing look into folk music and alien life forms. 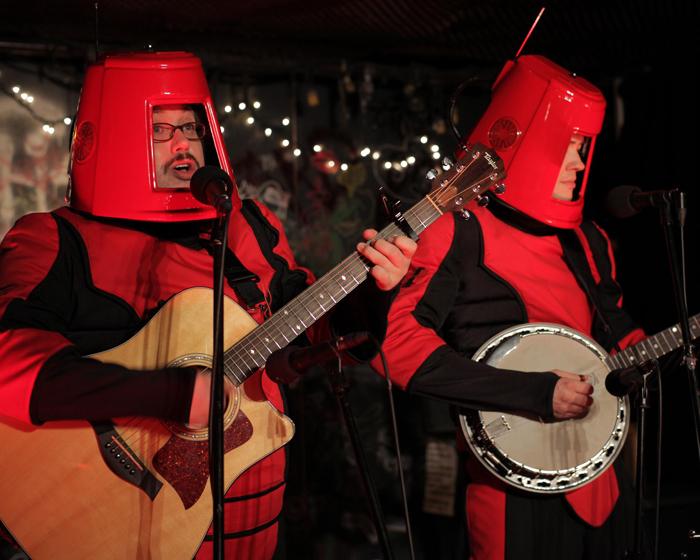 Supposedly, it’s also the origin story of bluegrass duo Future Folk, who have been entertaining audiences in New York City for a decade. They remind me a bit of They Might Be Giants now that I think of it. I’m not sure if anyone would really buy this as an “origin story”, but I guess you could draw some parallels between the feeling of alienation musicians sometimes feel and actually being and alien. Oh god, now I sort of wish I hadn’t thought of that. Let’s just say that interesting bands are allowed to have interesting origin stories and leave it at that. Tenacious D had a shot at it too. Anyway, the basic premise of the story is that Bill (played by Nils d’Aulaire) is from the planet Hondo, and he came to earth to take over the planet and make it his race’s home. However, he becomes enamored with music, so he decides not to bring any harm to the planet. It is not revealed that Bill is indeed from Hondo right away, but when Kevin (played by Jay Klaitz) – also from Hondo – arrives, it becomes clear that Bill is indeed an alien. Kevin also falls in love with music and chooses not to bring harm to earth. Bill had already been performing as a solo artist, but Kevin also joins him at a performance on the guitar (which he learns in a manner of hours). Thus the duo is formed. The audience basically humors them. They laugh at everything they say about taking over earth. The irony, of course, is that everything they are saying is true. What I like about Future Folk as a duo is that they have an esthetic that is very duplicable by their fans. That’s another post for another site, but suffice to say it’s no surprise that they’ve found some success doing what they are doing. I’m not sure if the title is quite right, though. Maybe it should have been called Hondo, because, in a way, that’s really what you remember about this movie. Sort of like how you remember “Station!” from Bill & Ted’s Bogus Journey, only more prominent. I would say that the chief weakness of this movie is simply the fact that there isn’t more music. I know they weren’t trying to make a musical, but the duo is just too fun to watch. They should have played a few more songs to round out the somewhat short 86 minute runtime. Otherwise, this film is definitely recommended. It’s one of the hidden gems of 2013.